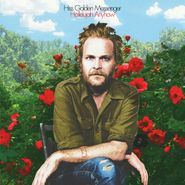 MC Taylor has only been recording as Hiss Golden Messenger since 2008, but in that time he has been incredibly prolific, roughly putting out at least one album a year (last year he had two with Heart Like a Levee and Vestapol). Sheer output aside, his particular style of folk-rock has developed into something deeply idiosyncratic and personal, without his albums straying too far from the genre’s fundamental sound. On Hallelujah Anyhow there are no drastic left turns sonically speaking, yet a greater sense of urgency seems to run through these songs than on previous releases; the album was, indeed, recorded in only a few days. Open-chord acoustic guitars and jubilant piano is the template here, with nasal vocals striking an uncanny resemblance to Bob Dylan. This would be the Dylan of New Morning, particularly, that upbeat, gospel-tinged, sunny morning record being the foundation for the world Hiss Golden Messenger inhabits. There’s weariness and pessimism to be found, no doubt, but let’s have a good time for the moment.